The west coast and lower North Island tribes have a number of canoe traditions. Four significant landing places of canoes are marked on this map. 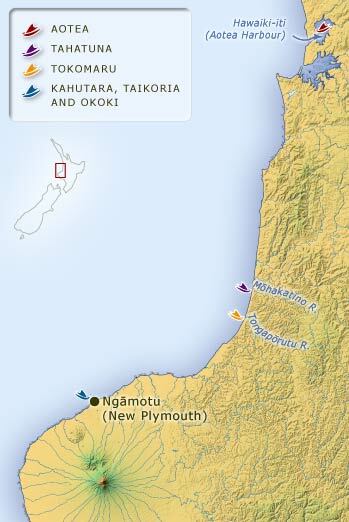 The Aotea, Tahatuna, and Tokomaru canoes all landed at different points on the west coast of the North Island. A further three canoes – the Kahutara, the Taikōria and the Ōkoki – are said to have landed together at Ngāmotu (the site of present-day New Plymouth).